Whiskey with spice and everything nice for the Rye lovers. When award-winning Sagamore Spirit opened its waterfront distillery’s doors and fired up its copper stills, it had two things in mind: turn out Rye that would put Maryland back on the Whiskey-making map, and create a destination to delight and educate spirits lovers from near and far. One year, two million pounds of milled grain, and 30,000 visitors later, the plan is well ahead of schedule. Sagamore Cask Strength Straight Rye Whiskey was awarded Double Gold at the prestigious San Francisco Spirits Competition, which as you know, means that their decision was unanimous. And we have to agree. The taste harkens back to the 19th century, when Maryland farmers discovered the benefits of distilling Whiskey from the distinctive grain. This is a truly exceptional example packed with everything you are looking for in a Rye, and the cask strength means that it is also an outstanding cocktail partner. 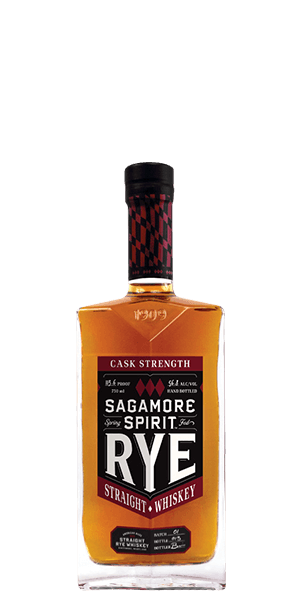 What does Sagamore Spirit Cask Strength Straight Rye Whiskey taste like? The Flavor Spiral™ shows the most common flavors that you'll taste in Sagamore Spirit Cask Strength Straight Rye Whiskey and gives you a chance to have a taste of it before actually tasting it. Classic rye pepper and spiciness with surprising florals, citrus zest, and caramel. Long and full with more black pepper and vanilla. I Love it all. I have no complaints about anything I have bought from you. You take very good care of me when I order anything. Tastes very smooth. Pleasantly surprised! Lots of flavor, spicy and packs quite a punch. Outstanding rye! Taste : First is spicey then rye with a vanilla finish. Noise is Caramel, fruit and vanilla. Bottom line, great cask strength rye. Loved it. I give you the highest regards for being the best. i really liked this rye. It's good straight or makes a nice Manhattan. Not really a rye drinker, but this tastes good. Very good rye, probably one of my favorites right now. I like the cask strength bottling, it really allows of the flavors to shine through, especially with a few drops of water. It is a little pricey for being so young, but if you love rye, I would definitely at least give it a try. It also makes an exceptional Manhattan. I think it's really great, but I paid $45 on the site and it's up to $80 now. I wish the price was stable. Not bad but almost feels bland at times. Too expensive for what you’re getting. A fabulous surprise! My hat is off to them!